The Multi-family real estate investment is the process of acquiring properties that provide housing for many diverse families . Unlike investing in a single residential home that you rent out to a single individual or family, multi-family buildings have several separate residences . Multi-family buildings ranges from a two unit duplex to a Mid-rise garden style or a huge apartment complex , but regardless of the size,these types of properties can be an amazing investment so long as you know what is involved with finding a property and understand the need of being a good landlord. It is usually the most cumbersome domains of Asset Development, Finance, Management & Financial Earnings for any individual, agent, investors and property sellers or even a bank or a financial institution. 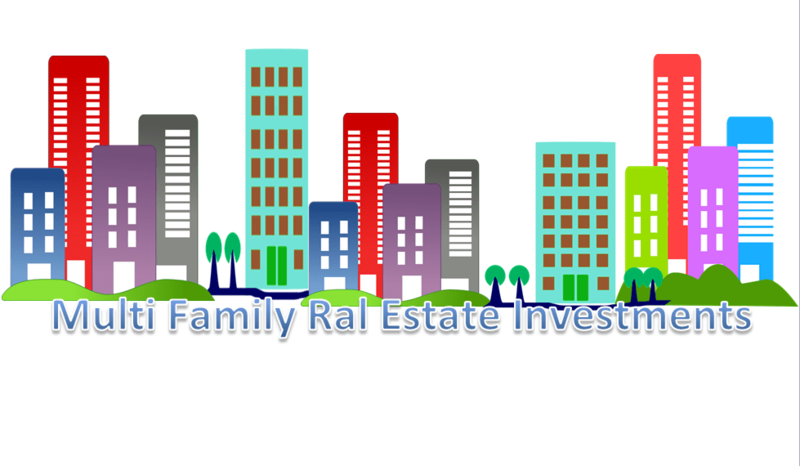 With financial pundits & experts extolling the features of a good asset for financial wealth, real estate project or marketing is now playing an ever-growing role for today’s financial health & results. If you are considering multi-family real estate investment, you may be likely to make a much larger investment than you would for a single-family home. You will probably need to be eligible for a mortgage of a rental property, that may involve a different authorization process than qualifying to buy your house. For example, applying for a mortgage for an investment property which is a multi-family unit may involve showing how the property itself will make profit by doing projections of your estimated expenditures and earnings . Once you have acquired financing and purchased the property, you need to deal with both the pros and cons of multi-family real estate investment. The most obvious benefits is that you have the potential to earn more rental income than you would if you had only a single unit and a single tenant. Your earnings sources are likewise diversified because you have a variety of renters. This technique can be safer than having just a single unit home, because when your tenant moves out of the single unit rental you are left with no rent in anyway. Needless to say, the downside to this is that you or your property management company will need to make sure all of the units are leased rather than just being bothered about finding a single tenant. If two occupants move out simultaneously, for instance, you’ll need to work to find two new qualified tenants. With multiple tenants, there is also the possibility of troubles among the tenants, like noise issues or other similar issues. Although these problems can persist to certain extent from neighbors in a single-family home, the issues tend to occur much more when many different families are sharing place. Having crystal clear rules in the lease regarding noise and tenant duties can assist you in preventing problems similar to this before they begin and employing a property management company can enable you to prevent going through issues of this nature at all simply because the manager will take care of them for you. Some other possible benefits of including a multi-family property in your real estate investing will vary based on the kind of property and your condition. For instance, you may be in a position to stay in the property yourself thereby making enough in rent for the tenant to pay off the mortgage loan, basically enabling you to live at no cost in your own home while gaining equity. You also can allow an on-site manager to live in one of the rental units in exchange for providing building maintenance. This could save you money as your management fee will probably be reduced and can help to make sure that your tenants are happy in the building and that issues are immediately addressed. Real estate agents and agencies in Hagerstown, MD help you in selling and buying multi-family real estate buildings and other real estate properties. They help in property evaluation and market analysis to make a clear deal. Hagerstown real estate agents help to negotiate a legal contract for benefiting both buyers and sellers. You can even seek advice for mortgage pre approval and select the right loan to balance your financial targets. Their services are geared toward giving services for property settlement process. You can get better guidelines concerning refinancing to reduce monthly payment or to convert your equity into money. As a Realtor, I will make sure you are informed on the current market conditions and a fair market value that the property can be purchased for. And if the property is overpriced I would not hesitate to tell you that the price is exaggerated and the property is simply not worthy enough at the asking price. So you can move on to the next property where you can make the right investment. When we negotiate and have agree on the purchase price, I will prepare the documents and help you to schedule inspections as well as refer you to couple title companies. I will also help you identify the surrounding areas. I will provide local statistics reports and information on neighborhoods, schools , colleges and other points of interest as well as industrial sites. As a Realtor, and after Being in the business for many years, I’m an expert on the local market and will help you identify the perfect property. I know all the places and very familiar with all the amenities available there. This ensures that when you go to see the site along with him, you end up making the perfect choice. You will never ever land up at the wrong place and feel cheated when you go to get the deal sealed with an experienced land agent . This is the most important benefit of having a veteran Realtor supervising things . The Commercial real estate market is still one of the healthy sectors in Hagerstown. Factors that contribute to this are the low overhanging housing inventory and vacant lots. Data from the Maryland Association of Realtor’s showed that spring this year, Hagerstown observed the profitable sale of existing homes. The figure rose by nearly 10 percent reaching 5 ,600 from the month of April alone. Compared to the previous years, the number of homes in Maryland sold for the month of May this season also jumped by 30 percent from the 2009 figures and 31 percent from the 2008 figures. Those interested to buy a residential property may take benefit of short sales. This kind of property for sale can be acquired at a low-cost price , but it may take a lot of endurance and convincing especially on the part of the lender . The reason for this is that the loan company which permitted the mortgage loan for the property may not easily authorize the short sale because the selling price is insufficient to repay an existing mortgage. Property sizes in Hagerstown vary tremendously from the flat medium sized ones to the large two-story houses . The flat homes are great for people that have old loved ones who are no longer fit climb and down the stairs and families with young children . When it comes to design , the things you will find in the city are those that have basement foundations and multi-level types . The Colonial style usually has two levels and four bedrooms with two to three bathrooms and two garages . Yet another type is the Ranch or Rambler or the one-level home common around Maryland and Virginia. Such a home also provides the raised version that is generally constructed on a hill and features the so-called walk-out basement.